If you live in the USA like we do, you find yourself doing a lot of conversions, because the rest of the world (or most of it) does not measure things like we do here. Now I could be ethnocentric and try to convince the world they’re wrong and we’re right, but that’s getting harder and harder to do. So, I won’t. But if you’re using Windows 10 and find yourself heading off to Google or some conversion site to convert things, let me tell you that you can convert almost anything you like without leaving Windows 10. 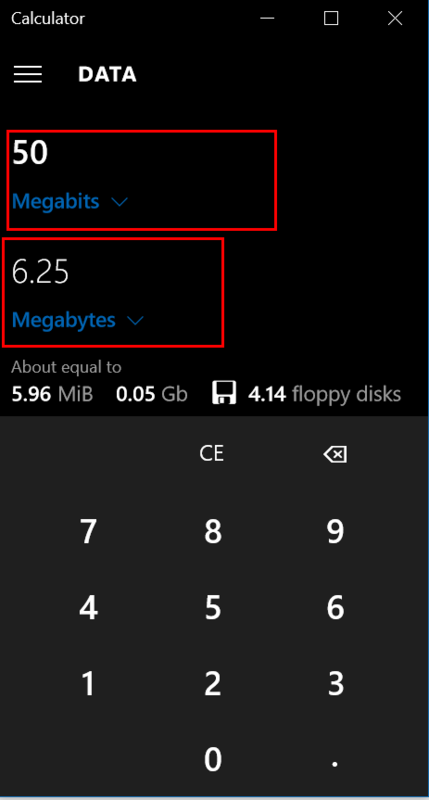 The calculator in Windows 10 can do a myriad of conversions with a minimum of effort, I tells ya. 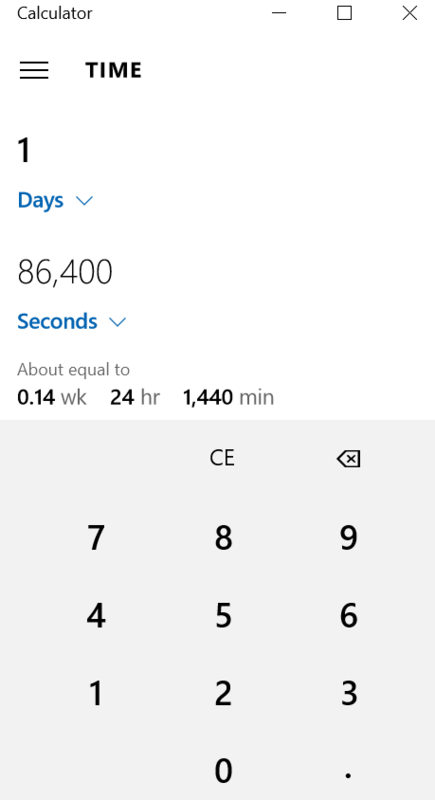 However, you’ll be glad to know that I’m not going to go through the entire range of conversions that Windows 10 calculator can do – it can do many. But I am going to give you a few examples, so I’m pretty sure you’ll be heading for the calculator if you have things you want to convert. Please note: Before you drive yourself insane trying to convert U.S. Dollars (USD) to Euros (EUR), you can’t. 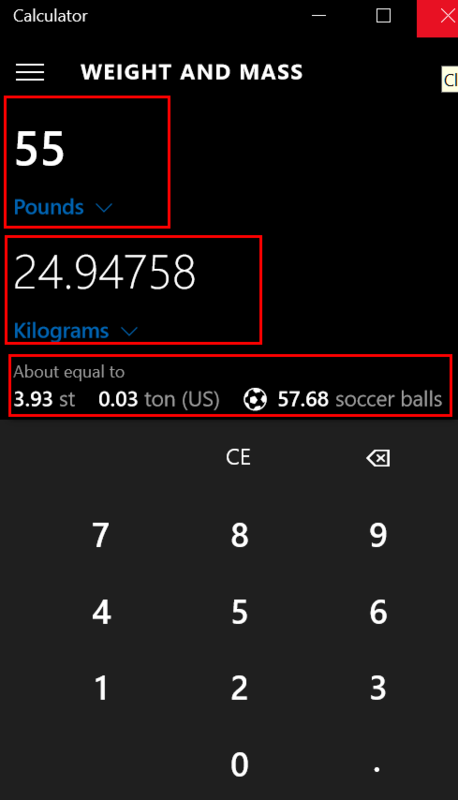 One thing Windows 10 calculator does not do is – monetary conversion. I don’t have any to covert so it’s not a big deal. If you need to convert money, open Google and type in USD to GBP (British Pounds), or USD to AUD (Australian dollars) or AUD to USD or NZD to USD or USD to JPY (Japense Yen)- you get the idea. Now that you know what the calculator can’t do, let’s see what it can do. If you click on the menu icon (4 horizontal bars ) you’ll see the “Converter” header with the types of conversions you can do with it. Like Volume, Length, Temperature, Distance, etc. See? Below: 34 Kilometers equals 21.13 miles (rounded off). 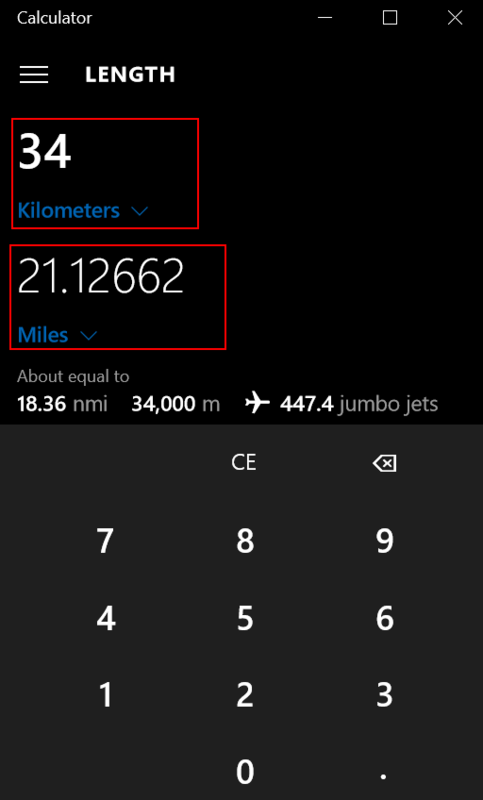 That’s 18.36 nautical miles, 34,000 meters or 447.4 jumbo jets. Below: Temperature. 74 degrees F equals 23.3 C. That’s 296.5 Kelvin. 0 Kelvin is absolute zero. Here’s an interesting one. If go to www.speedtest.net and test your speed, it’s going to be in megabits per second. So if you see you are downloading at 50 mbps that does not mean you’re downloading at 50 megabytes per second, it’s means you’re downloading at 6.25 megabytes per second. 8 megabits – 1 megabyte. 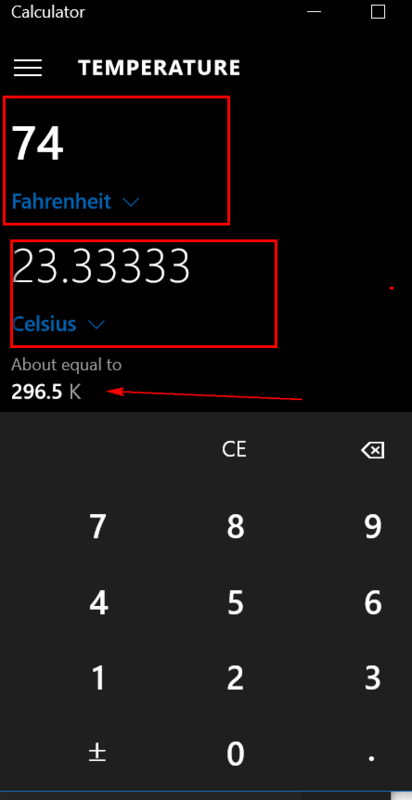 Now you know how to use your Windows 10 calculator to do a lot of different conversions. Oh, and I almost forgot: My calculator has a black background with white text, characters and numbers. Yours probably with have a white background with black text, numbers and characters. That’s because I’m using Windows 10’s Dark Theme. If you want to use the Dark Theme too, and your running the Anniversary Edition or newer, you can do that in Settings –> Personalization and click on “Colors” on the left side. 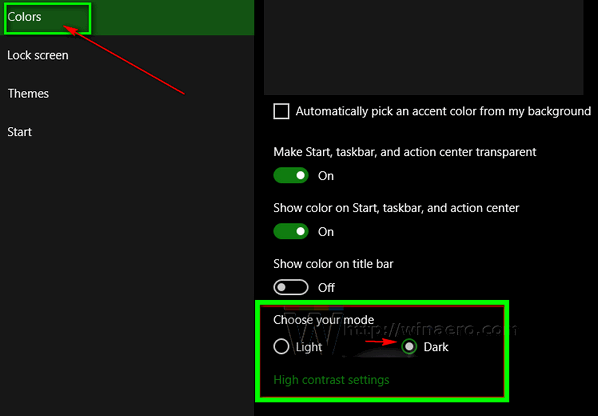 Then tick the radio button labeled “Dark” under “Choose your mode”. You’ll be on the Dark Side right away. If you’re not running Windows 10 Anniversary edition or newer, you will go crazy trying to find this setting. You can enable it with a registry hack. If you’re interested let us know – or else be happy with the light theme. See? I came back into the light! Now you know how many seconds are in one day. That’s a lot. 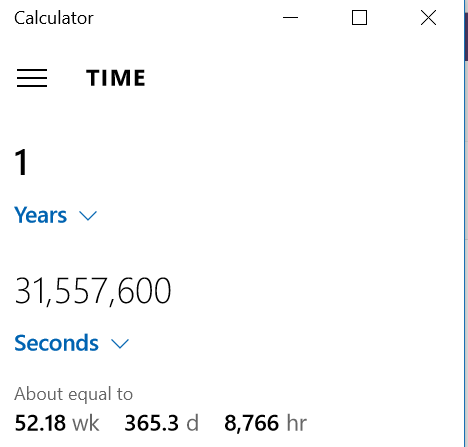 There are over 31 and a half MILLION seconds in a year? Wow! Where do they all go? And a trillion is a really big number. In order to live 1,000,000,000,000 seconds (one trillion) you’d have to be skulking around Earth for over 31,600 years. 31, 600 years ago, Our poor states were under ice caps and modern humans were just starting to do shrimp on the barbie. Humans that looked like us didn’t appear until around 50,000 years ago. If anyone reading this was a around then, please let me know.